Far, far away from anywhere. 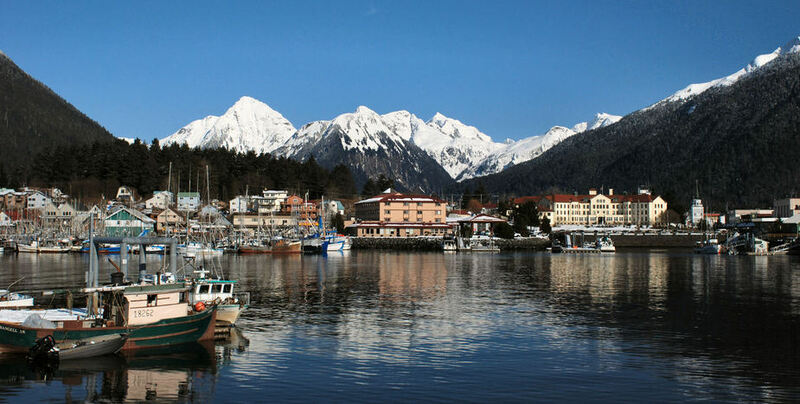 Situated in southeastern Alaska on Baranof Island you can only get to Sitka by plane or boat. The town is nestled at the foot of the mountains that dramatically rise out of the sea around the Harbor. It’s a fishing village that by Alaskan standards is a town—fourth largest in Alaska…I’ve been there. Since I wasn’t fishing it must have been a lady that brought me there which it was-a courtship that ranged from Maine to Sitka…go figure. It’s a beautiful place and like any Alaskan community it has more than it’s fair share of “characters”. I’m told the sun comes out in Sitka…could have fooled me. Every time I was in Sitka it rained…that was OK I was there for the beauty of an ex-pat Cajun woman anyway. Sitka may have found a way to turn that rain into money from the sky. 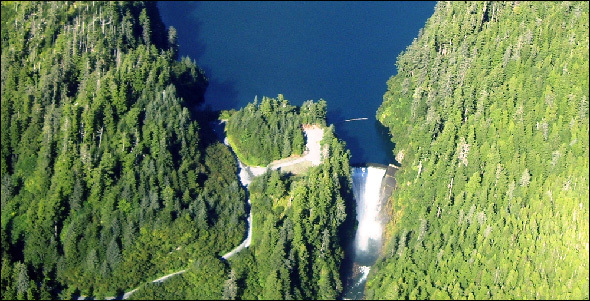 A Texas firm has entered into an agreement to ship 2.9 BILLION gallons of water at $.01 a gallon from Blue Lake Reservoir in Sitka to a hub in India where it will be distributed in Asia and the Middle East. That’s a lot of money for Sitka and that’s a lot of water. For readers of Fresh[water] Ideas for a Thirsty Planet you know the pressures, both ecologically and politically, of freshwater resources in Asia. For those who are new to this blog read the series on the Tibetan Plateau. You also know that Canada and that whole northern tier of land that extends into Alaska holds few people but over 10% of the world’s freshwater. So is this a good thing or bad thing? On one hand there are people in the world in increasingly desperate need of freshwater and places like Alaska have a surplus of freshwater over perceived needs …on the other the commoditization of freshwater opens up questions of sustainability of harvest for profit over human and environmental [think stream flows for salmon fisheries as an example] needs. Just recently the Alaska Department of Natural Resources received three new applications for bulk water removal from Adak Island in the Aleutian chain. The Aleut Corporation plans to export 1.5 million gallons per day from three reservoirs on the island. For Sitka this may well work…however, others have long looked into this issue with the result being that the bulk exportation of water in Canada is outlawed. Why? Maude Barlow is chair of the Council of Canadians, a citizens’ group with 100,000 members. She is the Joan of Arc of those opposed to the sale of Canadian water. “The wars of the future are going to be fought over water,” Barlow has declared. Her point is well taken. Who will be able to afford the cost of the shipped and eventually expensive Sitka water? Will this be the answer to foreign freshwater issues or is this a mirage of a freshwater oasis for those desperate for what is in such abundance in Sitka and elsewhere in Alaska. Neither Sitka nor Adak water nor water from any other Alaskan community will solve the Earth’s freshwater issues. The answer lies in conservation of present resources, protection of water purity through better sanitation, and protection both from point and nonpoint source pollution. These are issues Asia and countries like India need to address and not look at schemes to bring more water in–clean up your mess first…you’ll only foul the water that is being brought in. If countries keep on with the same sanitation and land use practices they’ll keep getting the same results. What happens when the people at the Asian hub of the Alaskan freshwater “pipeline” wake up one morning and the ship does not appear upon the horizon to quench their needs? For Sitka, I’d recommend bottling your own water in bulk and shipping it as boutique water. While bottled water sales have fallen, and there is great concern about plastic bottle refuse, the Alaskans I know could probably come up with a unique bottling solution that addresses those issues. Sitka, and Alaska, will keep the greater part of the value added profit from their own water and create jobs. I hope for that and for my “Sitka Girl”. This story is going to start playing out more and more in Alaskan communities or anywhere else in the world where supply exceeds demand for freshwater and the global freshwater crisis continues to build. Right now there are financiers and water entrepreneurs scouring the world for water rights. Some have good intent to address these issues responsibly having learned the lessons of places like Cochabamba, Bolivia. Others are just looking to make a big profit without due regard for the consequences. This is our collective challenge in our approach to this issue. The balance between water as a human right and water treated as a commodity is one that has and will create conflicts. As I have said in this blog many times we can avoid the suffering of conflict if we think ahead and approach the issue that water, like air, is fundamental for life and is not a resource that should be treated at the expense of another. I wish Sitka all the best…pay attention to the debate in Canada. “Perpetual human growth” is “fools gold”! The solution to the “local” water problem is to bring the “local human population & consumption rates” in line with the local water sources. Why is this simple concept so difficult to understand & implement?